This story was originally published in the Sandlapper, Autumn 2009. It is posted here in its entirety with the permission of the author. In 1940, World War II enveloped Europe. Belgium, Norway and France surrendered to the German Army. Italy, siding with Germany, declared war on Britain and France in June. Hitler’s parade into Paris was broadcast in American theaters on Fox Movie-tone News. Air battles and daylight raids between the Luftwafte and the Royal Air Force over Britain’s skies began in August. Men, women and children were dying. World War II was winding closer to home shores. 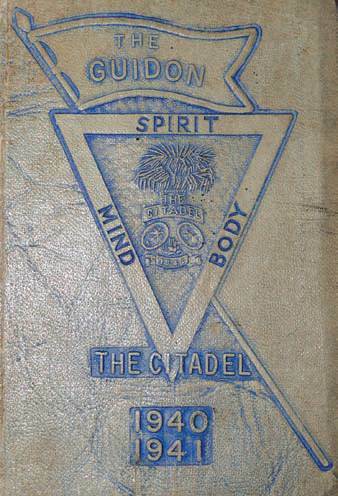 On September 2, 1940, 565 high school graduates reported to The Citadel in Charleston for their freshmen year of college. They came from across the United States. Each enthe same wrought iron gate. Young men arrived from California, Indiana, Pennsylvania . . . but most were South Carolinians. Registration began at 9 a.m. in the armory with forms to fill out and fees to pay. Freshman expenses were $531.50 for first-year South Carolina cadets, $671.50 for out-of-state cadets. Gen. Charles Pelot Summerall, Citadel president, welcomed the class that night. Among “the class that never was”—the anticipated Class of 1944—not one at the time could have imagined there would be no cadets in what would have been their graduating class. Reveille, the bugle wake-up call, sounded at 6:45 a.m. the first week, at 6:15 the rest of the year. There would be no turning over for a few extra minutes of shut-eye. The training cadre was meticulous in introducing the new class to all facets of cadet life, and that included early rising. 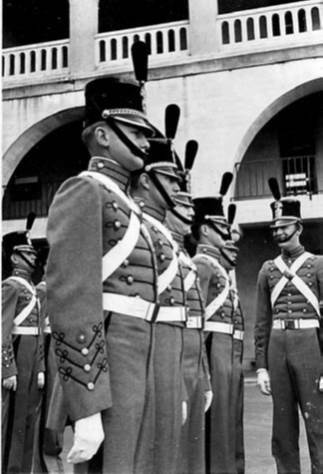 Freshmen quickly learned to stand at attention and parade rest, to answer all questions with the prefatory and ending address of “sir,” to clean and carry a rifle, to walk square corners and eat square meals, and to march double time everywhere. Answering immediately to names like “Mr. Dumbsquat” and “Mr. Doowilly” became second nature. They became skilled at not blinking at gnat and mosquito attacks on the parade field. The Citadel prided itself on its military training and environment. Self-discipline controlled every hour of the day. It “was very good for me,” says Edward Haynesworth of Sumter. His father and two older brothers were Citadel graduates before him. Sam Collins of Shelbyville, Kentucky, says his older brother Wallace, two years ahead of him at The Citadel, helped keep him from making too many mistakes. Arthur Cummings of Greenville chose The Citadel because he knew others who attended and admired their character. 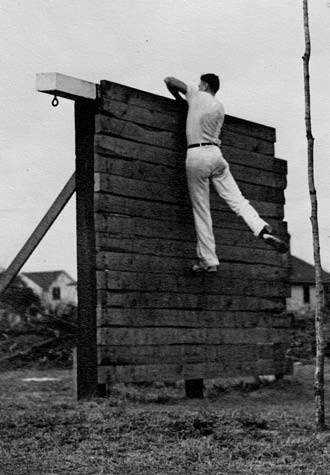 All plebes cringed at the order, “Drive by my room.” This command was issued by an upperclassman to a fourth classman (freshman) for more obedience training. Constant inspections by upperclassmen on the plebes’ uniforms, actions and room status kept them vigilant. to the regulations,” Sam Piper of Greenville says. Plebes learned to discipline their actions, thoughts and words. Their camaraderie grew daily. They respected one another for persevering. “The camaraderie fed on itself,” Chandler recalls. The Citadel ring was the ultimate prize. Like all those before and since, the fourth classmen of 1940 craved their graduation rings. But The Citadel’s training was and is to prepare soldiers to serve their country. On September 16, 1940, President Roosevelt signed the Selective Service Act—the first peacetime conscription bill. All men 18 and older were eligible for the draft. Now, the Class of ’44 had greater concerns than walking a tour. Training intensified. Some fourth classmen enlisted by the middle of their first year. Sherrill Poulnot of Charleston waited until 1942 to join the Navy. (“Three meals a day and a dry place to sleep was not so bad,” he reflects.) Only 428 of the entering 1940 class returned for their sophomore year. Japan’s attack on Pearl Harbor on December 7, 1941, prompted still more war volunteers from the class. 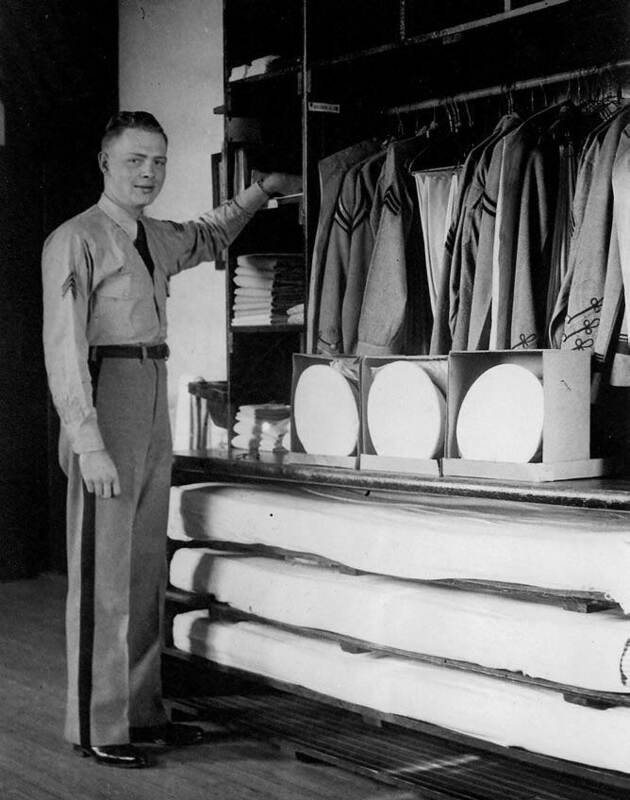 The Army Specialized Training Program was launched in December 1942; only a few specialized students would be allowed to stay in school. Changes were made in The Citadel’s calendar, faculty were informed of their new military status, and training in the rules and practices of war for Uncle Sam accelerated by the day. “The Enlisted Reserve Corps [ERC] told us we would get to graduate, just not when,” says class member Bob Adden. At the end of their junior year, the Class of ’43 recommended to Summerall that the Class of ’44 receive their class rings early. The general approved. What was so important about The Citadel ring? “Everything!” says Sam Collins, the Kentucky classmate. On May 2, 1943, the Class of ’44 marched to the Charleston station and boarded a train. They traveled to Ft. Jackson in Columbia to be inducted into the armed services. After processing, the train returned them to The Citadel. 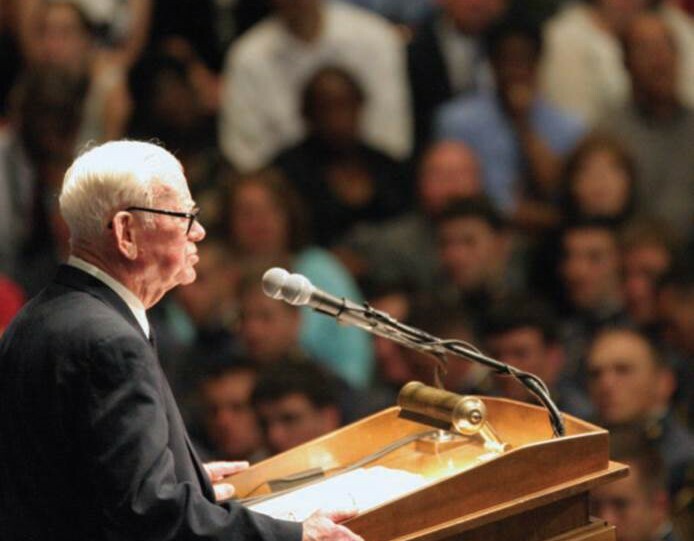 The United States had called the Class of ’44 to their duty—a duty for which The Citadel had trained them. The cadets finished their junior year and received a two-week furlough, then were ordered to 13 weeks of basic training. Officers Candidate Schools were the next stop. Then they were commissioned. For many, active duty ended in January 1946. Thirty-four soldiers from the Class of ’44 gave their lives to protect their country. Six were prisoners of war; four were imprisoned at the same time at a camp in Schubin, Poland. Countless received Purple Hearts, Silver Stars and Bronze Stars. They joined other Citadel men as guardians of freedom. Some continued active service after the war was over. Some finished their education at other colleges and universities. Others returned to The Citadel to complete their senior year for graduation as veteran students; 152 from the Class of ’44 received diplomas from The Citadel in 1946 and 1947. On Page 9 of the 1940 Guidon are Johann Wolfgang von Goethe’s words: “The destiny of any nation depends on what its young men under twenty-five are thinking.” The “Class of ’44” were men of character, dependability and self-reliance. In 1954, the class gathered for their first reunion at The Citadel, and they have met every five years since then. In 1994, they finally received their 1944 yearbooks. Many class members wrote synopses of their memories of The Citadel and the war years. The annual includes pictures from earlier annuals and statistics about the class. The class celebrated its 65th reunion at The Citadel’s homecoming November 7, 2009. The daughter of Sam Collins, I grew up attending many Citadel parades on homecoming reunion weekends. I watched the “Class of ’44” gather to stand in review. The corps marched past; cadets and graduates held their backs straight and tall. I remember the excitement of those alumni at seeing one another again, shaking hands and pounding backs. They huddled in tight groups, not wanting to miss one another’s words. Their grins of greeting were contagious. All the cadets were required to attend chapel services on Sunday; the general attended, also. The general often wore a cape, and his exemplary military bearing made an impression. The corps would stand in front of his home to sing “Happy Birthday” to him before breakfast. Dressed in his uniform with all his medals, he greeted the cadets with, “Gentlemen, this is indeed a surprise!” Gen. Summerall’s example followed them overseas. Many Citadel soldiers served in the same divisions during the war. Their training at The Citadel made them strong, and it didn’t break them. I and my brothers, Critt Collins, Citadel Class of 1973, and Lee Collins, had the privilege of being reared by a Citadel Man, so we closely observed his character. He taught us the importance of always doing the right thing.